In the end we will have an identical user interface with the same frontend functionality as we did with jQuery. We start by ”Angular-ify” our html view by adding necessary ng directives and bindings. This will allow us to use these spaces from our Angular controller to populate the html view with sensor data. We add the ”ng-app” and ”ng-controller” directives in the <html> tag, and link our css file, the Angular framework and our sensorController.js file in the <head>. Next we structure the ”container” part of our html file in three sections corresponding to the Bootstrap rows: the top row, the home security status row, and the sensor boxes row. 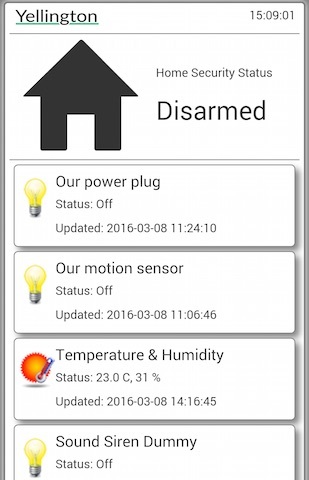 In the top row, we have added an Angular expression for binding clock data to our html, likewise in the home security status row, and in the sensor data row for sensor data. The ng-repeat directive is a neat thing that will assist us going through the retrieved sensor data from the server. The html view has no clue where this data comes from or how or when it should be updated. This logic is handled by the controller. Angular uses a ”controller” to take care of the logic for updating the data in the presentation view i.e. the html. We create a controller that looks like this and is linked together with our html file. var domoticzURL = "http://192.168.1.99:8080/"; //use this format if you want to place this file on another computer on your home network. //var domoticzURL = "../"; //use this format if you place this file in a folder in the www folder on your Domoticz server. What’s inside the curly brackets of the app.controller is the constructor of the controller class and will execute at the time of launching the web app. You will probably recognize most of the code from the jQuery version. We have an updateSensorData() function that retrieves the sensor data through http requests along with a timer to poll the server every second. The getSensorImage() is used by the html view to retrieve the corresponding url for the src attribute. Using Angular might require some time to get a feeling for how it works and how to utilize the built-in functionality. Once over that learning curve, it’s a nice framework to use. Counting the lines of code from the jQuery version and the Angular version gives us that jQuery required 142 lines of code whereas Angular required 117 – an 18% improvement. However, the biggest improvement is an increase in readability and structure and thus maintainability.